Welcome to Brooklyn. Home of really awesome pizza, bagels and so much more when you think about it. 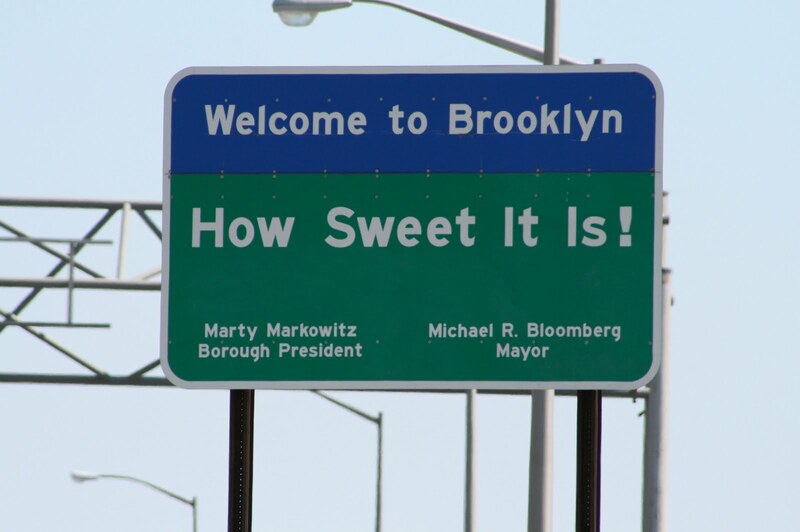 The hallowed headquarters of PiercingMetal.com is cloistered deep in the middle of a region called Bay Ridge and when visitors travel over the Verazanno Bridge and reach this area as their first point they see this sign very prominently. 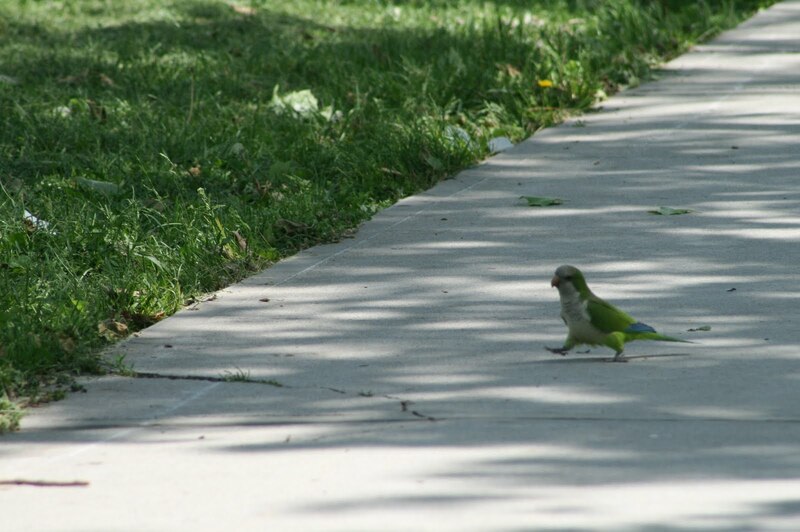 This part of Brooklyn also seems to be the home of a bunch of wild parrots, which are affectionately called “Brooklyn Parrots”. 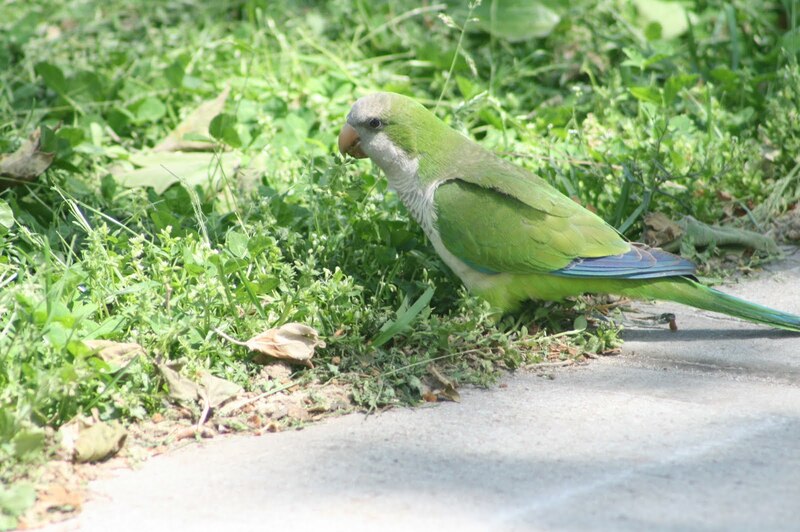 Their real name is Monk Parakeets but they are much larger than your typical parakeet that one would find in an aunt or grandmother’s house. So anyway, while doing some neighborhood wandering my friend said how he was interested in seeing if we could find them. 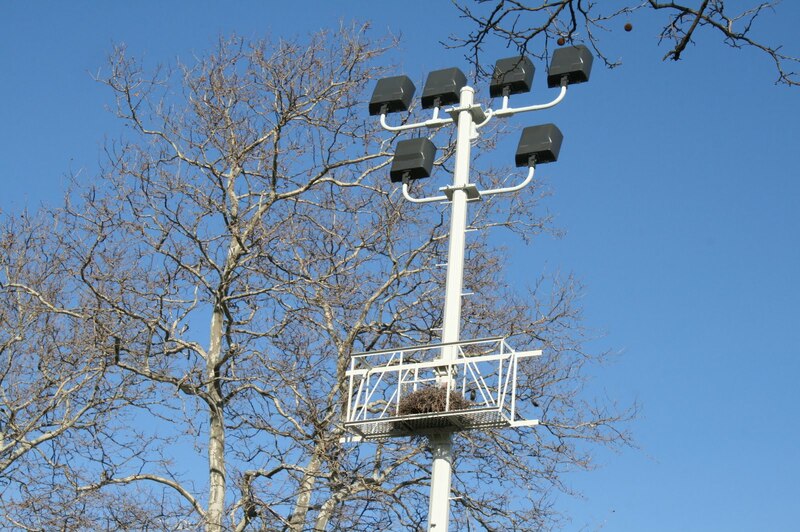 After quite a bit of upward glancing we realized that there were some nests for said parakeets up around the Leif Ericson Park. You remember the location, its the one where I did my Viking Quest that you all seemed to enjoy so much. Anyway, these nests were rather large and what you see in the photo is about 3 stories up if you had to get a size gauge. 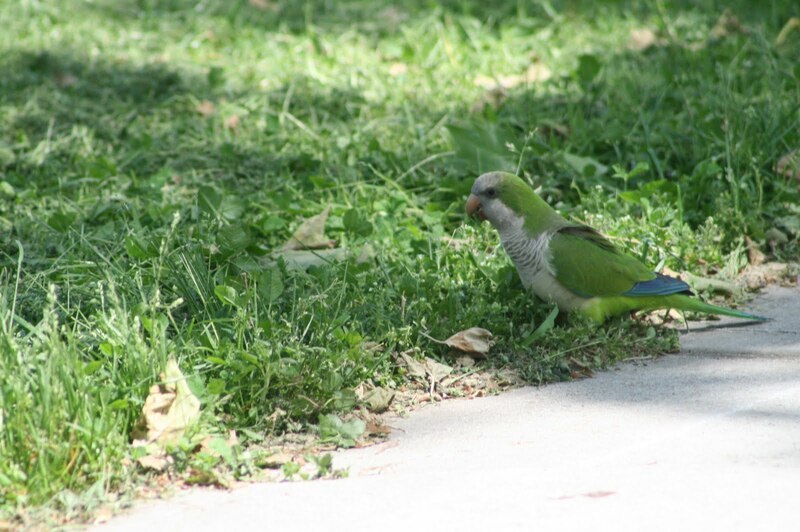 Of course while we found the nests, we did not see any parrots……yet. 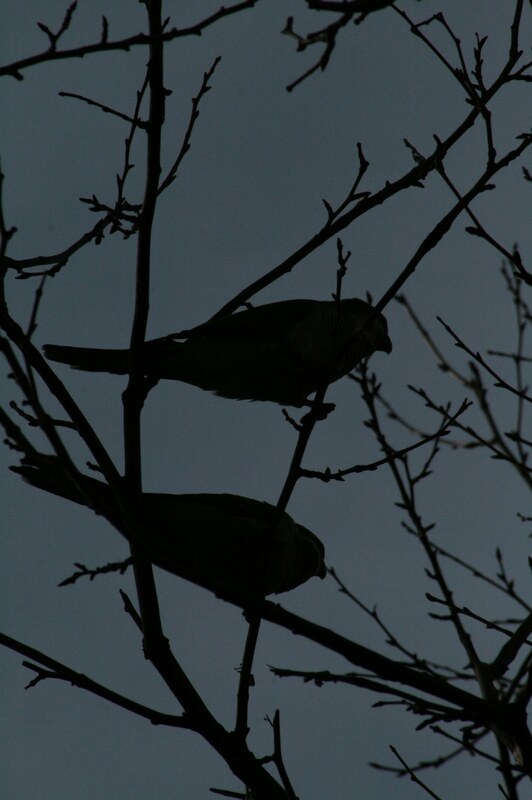 Some more walking and searching finally led the adventure team to locate some of the parrots who were really heavily involved in some work. I snapped a shot of this guy quickly and while you might think me being artistic, I was instead totally fussing with my settings and not getting anything that I wanted. Of course if you enjoy the way this shot looks then please understand that it was totally planned. You can’t see my fingers crossed behind my back from your vantage point right? Our friend was soon joined by another bird and our first one seemed to be in charge of the action. That one was directing the flow of activity as the other one took branches and flew off to the nest we saw earlier (or another like it). Pretty cool actually to see all this happening only about 20 feet away from our view. A third parrot joined in on the festivities and we managed to get another shot with all three of them even though its rather grim in its color scheme. 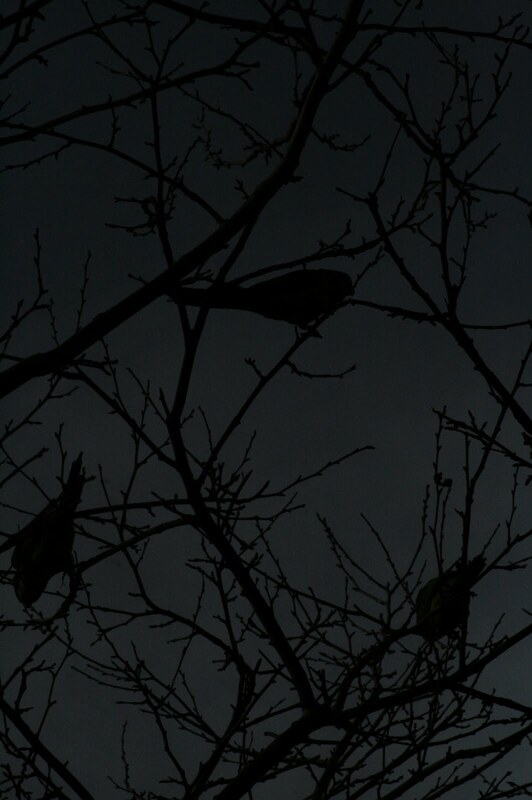 In one sense this looked like some perfect Black Metal album art and since the birds all vanished moments after I snapped I vowed to return after resetting the device and see what we would get the next time around. Lucky for you the wait is only to scroll down a little further. 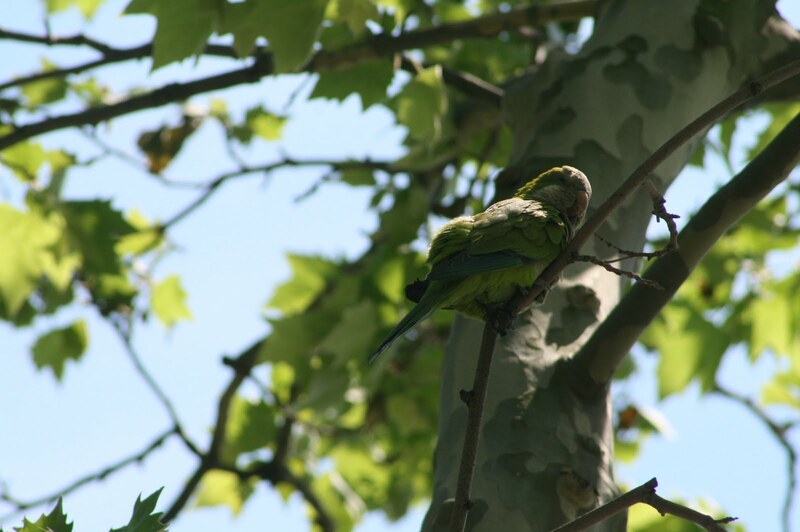 And here we are again and in living color this time as one of the monk parakeets enjoys the sun. He was whistling up a storm and I am sure a little curious as to who these people directly below him were and why were they snapping away with those unknown devices. I was not too far away from him when he jumped down to the ground or flew actually when you think about it, and began to scurry across the pavement to the nearby grass. He was clearly on a mission and I chose to stay out of his way and hope that my zoom lens would not fail me. I was not close enough to see what he was noshing on and I didn’t want to frighten him away so I stuck to my position and let him enjoy himself. Or herself, whatever the bird might have been. 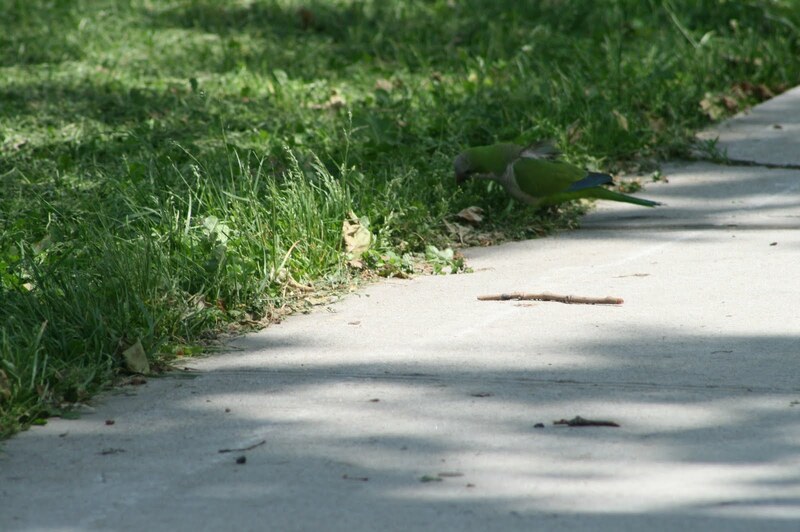 Our colorful feathered friend was of a decent size and about 8-10 inches high by my observation. I zoomed in a little closer to give us all a better look at this truly beautiful creature. 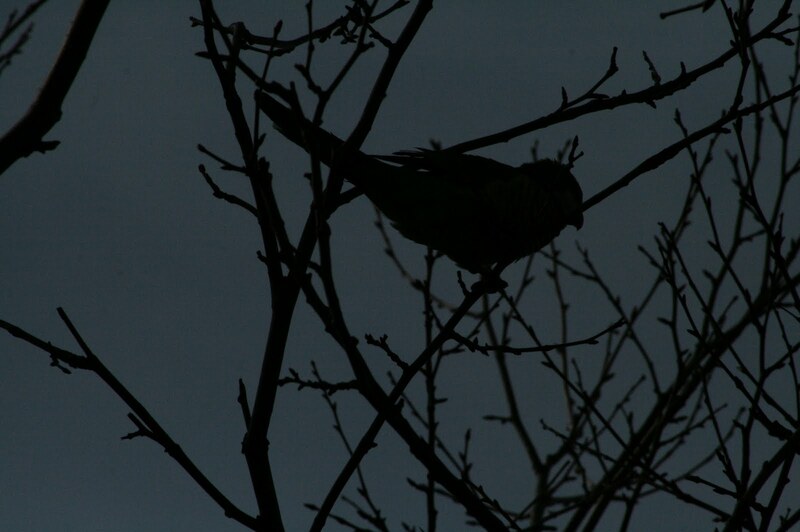 The parrot flew away again and I guess it felt that it had given me sufficient time out of its busy day. It was really cool to finally catch one of them with the camera. Perhaps as the summer comes into season I will wander down that way again and see if I can snare them doing anything else that would be worth sharing with you all. If you want to read up a little bit about these wild birds you can do so via their Wikipedia entry right HERE. Previous PostTom Otterness’ “Life Underground”: A Public Art DisplayNext PostPiercingKen Is Now On Twitter: Live, Love, Follow…..